Al Hadeed is the newest residential area built right in front of Al Raha Beach. Both the Al Hadeed apartments and the Aldar townhouses are ideal for the beach lovers. The moment you step into your apartment, you’ll immediately feel the breeze of the beach and marvel at the clear blue seas. Al Hadeed has spectacular floor plans to brag about with up to 3 bedroom apartments and 5 bedroom townhouses in the community. You’ll also be amazed at the meticulous interior these apartments and townhouses offer. 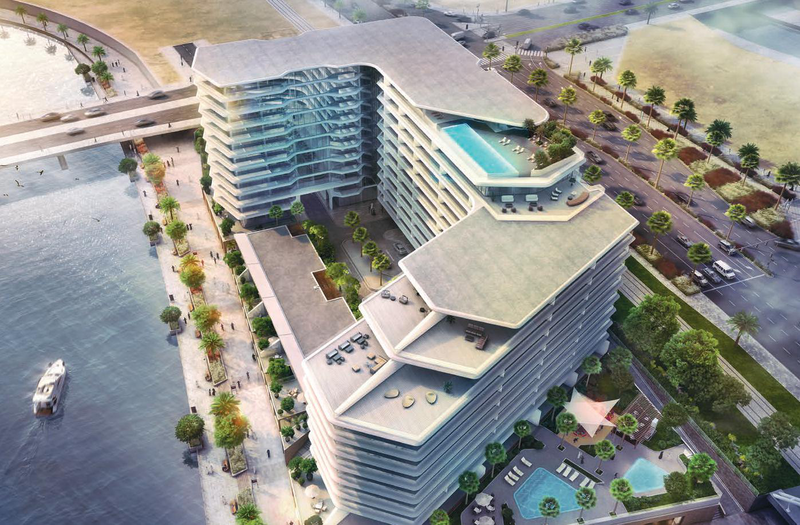 You’ll enjoy glass covered balconies and huge terraces allowing you to fully enjoy your beach experience. Al Hadeed also offers large bedrooms and luxury bathrooms for you to enjoy. Al Hadeel is an exquisite combination of the sea’s serenity, urban conveniences, and luxurious interiors. The bedrooms and living areas both offer a scenic view of the waterfront straight from the front door. You’ll also get to enjoy the glass-fronted balconies which definitely enhances your panoramic view. The interiors incorporate contemporary kitchen designs along with elegant bathroom fixtures. There are twin washbasins and walk-in closets in the master bedrooms. Al Hadeel’s highly detailed architecture allows you to enjoy a lavish and absolutely stunning lifestyle. Al Hadeel was made by Aldar to cater to those who enjoy luxury – and it does exactly that with its villas. Its 5-bedroom homes all have 8 different configurations that you can choose from. The villas are also made of both indoor and outdoor spaces with the indoor consisting of 300 square meters and the outdoor consisting of 54 square meter gardens. Al Hadeed is definitely one place not to miss out on if you want a luxury living in Abu Dhabi.